Jack O Lantern – Turnip!! 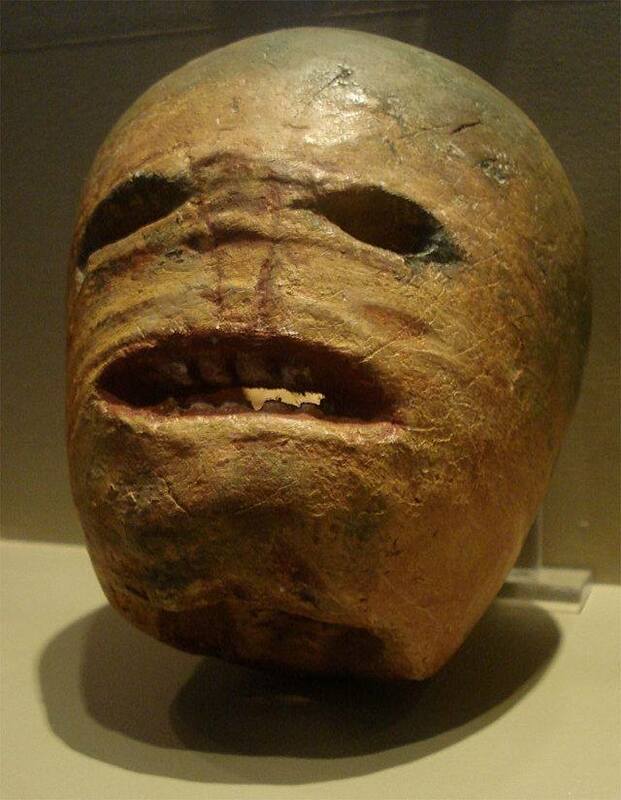 A traditional Irish Halloween turnip (rutabaga) lantern on display in the Museum of Country Life, Ireland. In Ireland they don’t have pumpkins they would carve turnips. When the Irish immigrated to the US they found the pumpkin cheap, easily available and much easier to carve. So our tradition started. Much of the Halloween tradition is from that country to ours. It was at one time called Mischief night children tipped over out houses and set small fires as well as other shennanigans. The tradition of giving out candy treats to stop the tricks (mischief) was started to end this. The costumes were also from Ireland where beggars to houses would wear disguises to keep from being recognized. This year Halloween or All Hallows Eve or in Wiccan religion Samhain will be on Friday the 31st. It could be conceived as lucky or unlucky depending on your beliefs. Christianity and other organized religion has almost completely wiped out Paganism which was the basic for belief for thousands of years. Today only a few follow in it’s footsteps. Until the Christian Era witches or wise women were held in high regard. They were the healers and leaders in many societies with their knowledge of healing and herbal science. Much of this knowledge has been lost but a lot of the herbal cures are now being revisited with new respect. When Christianity came to the forefront they needed to put the Pagans aside so made these people to appear wicked and malevolent. They were oftentimes blamed for sickness and death because of their secrets and healing powers. They were prosecuted into the underground world where they remained for centuries. Today witches or modern Wiccans are a recognized religion. They harm none and oftentimes do much good. Women were also prosecuted more than men because men wanted to take down the matriarchy that was in many societies in ancient times. One can look to the oracle of Delphi to see the power that women once held. The bible has edited out most of the powerful women of the early church as well. Mary Magdalene is now thought to have been one of the early leaders with Jesus but has been maligned to take her from the leadership post she once held. Mary has many of the same attributes as the ancient goddesses including virgin birth. One only has to look at the legends of the Egyptian goddess Isis. The parallels between Isis and Mary are startling including the virgin birth, Stars on her cloak and being the protector of sailors. Before you put out that witch with the wart on her nose take a moment to think about the real witches among us. As always thanks for reading! !